ITC Limited (ITC) is one of India's foremost private sector companies having a diverse portfolio of businesses. The company has been undertaking several CSR initiatives over the years and been appreciated for them globally. ITC Limited (ITC) is one of India's foremost private sector companies having a diverse portfolio of businesses. The company has been undertaking several CSR initiatives over the years and been appreciated for them globally. The case discusses ITC's CSR initiatives and focuses on its approach. The company's innovative ways and heavy investments to achieve the 'triple bottom line' are discussed. The question to be look forward "Is it taking the right initiatives and setting standards to follow?" ITC is one of India's foremost private sector companies with a market capitalisation of over US $ 30 billion and a turnover of US $ 6 billion. ITC has a diversified presence in Cigarettes, Hotels, Paperboards & Specialty Papers, Packaging, Agri-Business, Packaged Foods & Confectionery, Information Technology, Branded Apparel, Personal Care, Stationery, Safety Matches and other FMCG products. While ITC is an outstanding market leader in its traditional businesses of Cigarettes, Hotels, Paperboards, Packaging and Agri-Exports, it is rapidly gaining market share even in its nascent businesses of Packaged Foods & Confectionery, Branded Apparel, Personal Care and Stationery. As one of India's most valuable and respected corporations, ITC is widely perceived to be dedicatedly nation-oriented. Chairman Y. C. Deveshwar calls this source of inspiration "a commitment beyond the market". In his own words: "ITC believes that its aspiration to create enduring value for the nation provides the motive force to sustain growing shareholder value. ITC practices this philosophy by not only driving each of its businesses towards international competitiveness but by also consciously contributing to enhancing the competitiveness of the larger value chain of which it is a part." Inspired by the overarching vision of making a contribution to the national goals of sustainable development and inclusive growth, ITC has innovatively crafted unique business models that synergise long-term shareholder value creation with enhancing societal capital. This commitment is reflected when ITC measures accomplishments not only in terms of financial performance but also by the transformation ITC has consciously engendered to augment the social capital of the nation. 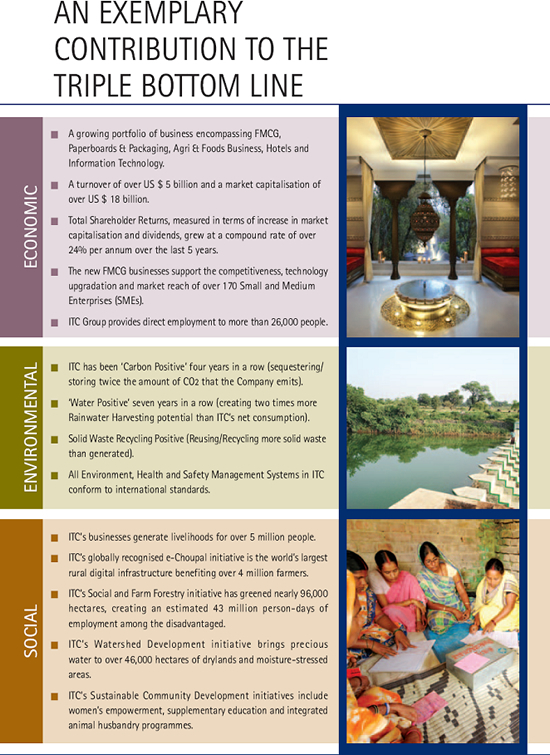 in ITC's 'Triple Bottom Line' approach of contributing to the economic, environmental and social capital of the country. Envisioning a larger societal purpose has always been a hallmark of ITC. The company sees no conflict between the twin goals of shareholder value enhancement and societal value creation. The challenge lies in fashioning a corporate strategy that enables realisation of these goals in a mutually reinforcing and synergistic manner. As a corporate citizen with enduring relationships in rural India, ITC has a history of collaboration with communities and government institutions to enhance farm productivity and the rural resource base. ITC's commitments in agricultural R&D and knowledge sharing have spanned vital aspects of competitiveness - efficient farm practices, soil and water management. ITC is committed to a national agenda of raising agricultural productivity and making the rural economy more socially inclusive. ITC believes that the urgency and scale of these tasks make market linked solutions and innovations more effective and sustainable than capital intensive approaches.